The six-inch blade of the Rajah II serves either as a camp knife or a brush chopping bush knife with enough weight and size for effective work. Built in the style of the famous Gurkha kukri, this design by Andrew Demko adds modern materials and Cold Steel's high-tech features to one of the favorite knives of Nepal. Unfolded, this 14-inch-long knife of AUS8 high carbon stainless steel feels almost like a machete but is small enough for finer work around camp. Equally good at slashing or piercing, the kukri puts the weight in the forward half of the blade for a more deadly impact. For light chores, the Raja II works like a small camp axe, but the reverse curve of the plain-edged blade is much better at slicing. Draw a rope or seat belt across the recurve and it pulls the blade deeper into the cut. The knife works quickly but with an edge you can maintain with a honing slip. In the Rajah II, Grivory handle grips add strength and durability equal to metal without adding unnecessary weight. Developed for the high stresses and temperatures of automotive applications, the Grivory forms an efficient shape that lends itself well to many grip styles. The Rajah II even works well reversed in an underhand grip. Pressure on a thumb plate swings the blade open and locks the knife blade in working position. An improved Tri-Ad lock shifts strain from the blade to the stainless steel liners of the handle through a strong locking pin. The Rajah II's pocket clip mounts to either side of the grip so owners can configure the knife for either right or left-hand deployment. The long handle of the Rajah II won't fit the pocket well, but the clip allows mounting the knife directly on the belt. 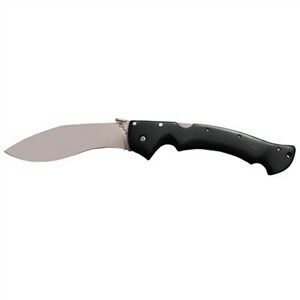 Try the S&W Search and Rescue Kukri if you're looking for a dependable fixed blade based on the same concept.